So, I am killing and crushing my weekend in Richmond. Last night, I got home from work and laid down for a few minutes. I fell asleep and didn't wake up for another three hours. And so there I was, awake but disoriented. I ended up staying up late reading, then slept in til about 9AM. I got up, got dressed and got my breakfast at the deli across the parking lot. It was OK. No rye bagels. I may try again at a different place tomorrow. I ended up with a greek yogurt, granola, fruit and honey parfait. It was great. From there, I went to Midlothian, about 20 miles from here. There were some stores there that aren't in this part of town. I ended up with 2 pairs of sandals - buy one, get one half off. Dirt cheap. And necessary, as my silver sandals are looking beat up. Thanks, Target!!! I bought a blouse at Macy's, and wandered around a few other places. I ended up going to Lidl, which is this new store that hopped the pond from Germany. It's similar to Aldi. On STEROIDS. I bought groceries there on Monday and I needed to restock fruit, and a few other staples. I also bought a duffel bag for $10, which I need to get my cat head home. I will probably do shoes and dirty clothes in the duffel, everything else in the rolling bag. I'm checking both. I grabbed Chick-Fil-A for lunch - just a sandwich and some diet lemonade, then I came back to the hotel. Did some more reading, took a quick nap, and then... it was massage time. I went to a place called Hand and Stone, where I got a one hour trigger point massage. She did a nice job of attacking my shoulders, she put some peppermint oil on my scalp, and I feel loose as a goose. After the massage, it was time for dinner. 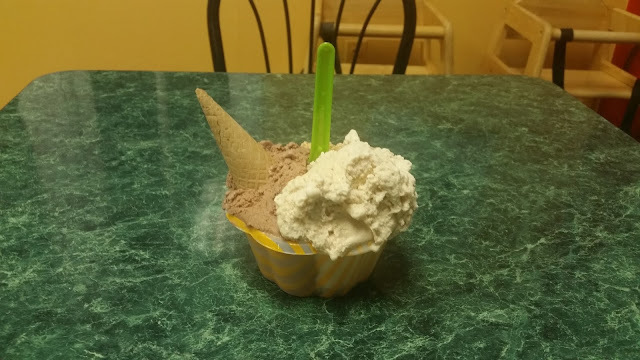 I went to a place recommended to me by the other trainer - it's a gelato place near the office. I ended up with a nice mix of beige. Chocolate, Hazelnut and Coffee. And then, I came home. Well I came hotel. It has been a quiet weekend, and apparently, just what I needed. I think. I do know I'll be getting gelato again before I leave. Because I need to try strawberry, peach and honey almond. It's science.